When travel writer Lily Moore joins a group of journalists for an all-expenses-paid press junket to Acapulco, she expects sun, sand, and margaritas. Instead, she finds that the Mexican city, once the playground of Hollywood stars, is a place of faded glamour and rising crime. Even the luxurious Hotel Cerón, isolated from the rest of the town, seems disturbing to her, with its grand, empty rooms, ever-watchful staff, and armed guards patrolling the grounds. Anthony Award–winner Hilary Davidson weaves a thrilling story of paranoia, vengeance, and murder. 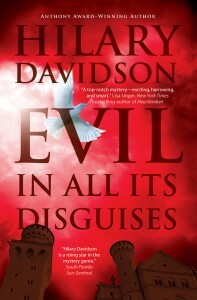 EVIL IN ALL ITS DISGUISES (ISBN 978-0765333520) was published by Tor/Forge on March 5, 2013. Buy the book. Read an excerpt online. Check out the “Evil in All Its Disguises” Pinterest board to see some of the inspirations for the book. Reviewers: download an advance copy via NetGalley (registration required). Booksellers: download an advance copy via Edelweiss (registration required).